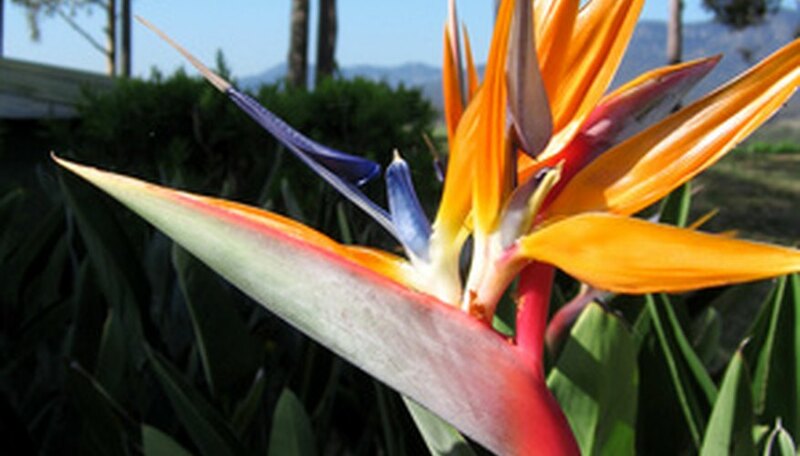 Bird of paradise (Strelitzia reginae), also known as crane flower, is a South African native plant. Bird of paradise was once classified in the banana family because of its leaf shape, but now belongs to its own family, Strelitziaceae. Its colorful foliage and showy blooms evoke a tropical feel in landscapes or indoors. Bird of paradise is an evergreen herbaceous perennial or shrub with a clumping, trunkless form and coarse texture. It reaches 4 feet high with a spread that increases with age, up to 10 feet across. Its leaves are simple, oblong to lance-shaped, and thick and waxy, up to 1 ½ feet long and 6 inches wide. Bird of paradise flowers appear periodically throughout the year, like a birds in flight, with brightly colored blue fused petals and long orange sepals borne in 8-inch, green, boat-shaped bracts. Outside, grow bird of paradise in sunny or partial shade areas for the best flowering. Shade-grown plants will be taller and have larger flowers, and full-sun plants will be smaller with flowers on shorter stems, according to University of Florida extension. Space plants 6 feet apart in nutrient-rich, well-drained, organic soil. Fertilize every three months during the growing season or use a slow-release fertilizer following label instructions. Water frequently during the growing season and only when the soil is dry in winter. Mulch around the plant, but keep a 2- to 3-inch area around the stem clear to reduce the chance of stem rot. Bird of paradise is hardy in USDA zones 9 (with protection) through 11. Indoors, grow bird of paradise in a high-light location. Mist during winter months if humidity levels fall below 60 percent. Fertilize every two weeks in spring and weekly in summer with a dilute solution of commercial liquid fertilizer. Plant bird of paradise as a landscape specimen, in mass plantings, in containers or as an accent plant or houseplant. Bird of paradise is also a popular fresh-cut flower in tropical-themed flower arrangements. Problems and pests for bird of paradise are relatively rare in both outdoor and indoor plants. Occasional insect pests include scale, aphids, caterpillars, grasshoppers and snails. Root rot results from waterlogged growing conditions. Consult your local extension office for pest identification and management specific to your location.